The sun still never quite sets on the British Empire, though it is sinking ever lower on the horizon. Apart from Hong Kong, which remains a Gurkha-garrisoned crown colony, Britain is rapidly withdrawing its historic military presence from the Far East. The huge naval yard and three airbases in Singapore are being turned over to the local government; the Persian Gulf bases of Bahrain and Sharjah will be closed down well before the end of next year; and Aden has become a port of call for the Russian navy and a barracks for wayward Arab guerrillas. Britain's withdrawal from the Far East represents a reluctant political retreat for the Tory government of Prime Minister Edward Heath. He promised to re-study, if not reverse, the pullout east of Suez that was pledged by Labor's Harold Wilson in 1968. But the harsh imperatives of economics have forced Heath to adopt Wilson's policy—with one important change. A loosely knit, five-power "consultative defense arrangement" with Malaysia, Singapore, Australia and New Zealand is scheduled to come into effect by Jan. 1. Prince Philip, who passed through just before Easter, sized up the situation succinctly: "Obviously, you've all given up something for Lent." In Royal Air Force parlance, Gan is an "unaccompanied post"—the only one in the R.A.F.—and that means unaccompanied by wives or girl friends, because there is no room for them on the island. There are 650 men on Gan, but only one female, an Irish matron sent out by the Women's Royal Volunteer Service "to give the lads someone to tell their problems to." They would burn her ears off if they did. The Maldivians from other islands who work on Gan understand; they call the base the "island of not having." The frustrations take many forms. "I 'aven't sowed me oats in nine months. I'm 22 years old, and at my age I need me oats," says one angry veteran of Gan. "I'll be married three months after I get off this island. I'm ripe for picking by the first bird who comes along." Others haunt the airport lounge in the hope that the next load of passengers in transit will include a girl they can talk to—or even just look at. Most flights passing through carry the R.A.F. equivalent of a stewardess, known technically as a loadmaster or quartermaster and to the men on Gan as "quartermattress" or, simply "Q." Proof of conquest is almost impossible; the only man to provide it was a now legendary corporal who came down with gonorrhea and was carried in triumph to the base doctor on the shoulders of his peers. Middle of Nowhere. Part of the problem is that under the terms of Britain's lease, the men are restricted to Gan. The arrangement protects the Maldivians on other islands from the shenanigans of off-duty airmen and shields London from charges of interference in local governmental affairs. More than 800 Maldivians work at the base, thereby earning a fifth of the country's total foreign exchange, but they cannot live there. Instead, they commute to work by boat. Those from distant islands sail across the lagoon in dhow-like craft called buggalows, a trip that can take four hours when the wind is wrong and the current strong. Most come from Fedu, a sliver of an island barely 200 yards to the west, rowing back and forth in small, sailless dhonis. Gan was not even an afterthought of empire, but rather, a byproduct of the empire's collapse. Its first military use was as a secret Royal Navy supply base (code-named Port T) during World War II. Abandoned after the war, it was resurrected in 1957 as a substitute for an R.A.F. 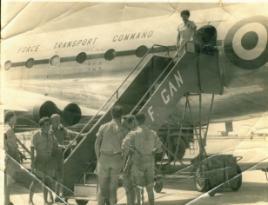 staging base in Ceylon, which had come under political attack. It is a supposedly vital relay station in Britain's high-frequency military radio link, and is zeroed in on the Skynet military communications satellite. But Gan does not have attack capability. Its only missiles are small weather rockets, and the only plane usually on the island is an old Shackleton bomber standing by for search and rescue missions. For defense, Gan has a token supply of rifles and a few machine guns. As for the Russians, if they are anywhere around, Gan has never seen them, perhaps because it has no reconnaissance planes. A radar, communications and weather station and a refueling base for R.A.F. planes on the London-Singapore run, Gan is little more than a runway in the middle of nowhere. It is so far out and so tiny it literally bristles with radio navigation aids to keep airplanes from missing it entirely. Marathon Blast. Gan is not entirely without diversions. Its clear waters boil with bright tropical fish. Tuna can be caught from the pier, and fishing for shark and barracuda is superb. The island has a soccer field, golf course, assorted tennis and volleyball courts and no fewer than 21 bars. The specialty of the island is the "gozomie," a marathon blast that is thrown when anyone reaches the end of his nine-month tour and goes home. Over the five-day Christmas holiday, the men consumed 500 quarts of liquor, 12,500 bottles of beer, and 2,000 pints of draft beer. Nonetheless, morale is surprisingly high. Says the base's commanding officer, 42-year-old Wing Commander Bryan Gee: "Nobody's got special privileges here. We're all in the same boat." Even so, Gan is a post where service can be endured, but never prolonged. As Flight Lieut. Edward Ratnaraja, the island's accounting officer, says of the island of not having: "I will be happy only when what I am not having is Gan. That should be two months, 17 days, six hours, 35 minutes and 21 seconds from right now." "For those who may be interested I have just come across the photograph I have been looking for ever since I first discovered the Gan Remembered site. It is of the arrival of the very first WRVS lady on Gan. She is stepping down from the RAF Transport Command Comet to a welcoming committee of a few OR's including yours truly, Geoff Smith and Tony Hill,I think, all three Stn. Armoury(SASF) the others whose names I cannot remember were probably all SASF ground crew. Sadly there are no further details as to date of arrival or the lady's name but at least we can all say "I Was There!"" "This photograph is the first female resident on Gan, Gwen Caton. If anyone recognises either themself or others please e-mail me - club.sec2@talktalk.net with details. The date must have been around late August to October 1960. I was on leave in Penang for two weeks in August and I left Gan for home in November. I am 3rd from left on photo, 2nd from left I think is Tony Hill and 5th left facing away from the action is Geoff Smith. Tony and Geoff were both J/T armourers and my colleagues in the Stn. Armoury. I will be pleased to hear from anyone from those wonderful days." "Problem solved at last gents. Taking Larry Dodds advice I contacted the WRVS Archivist and two days ago received a letter from him confirming that Gwen Caton did indeed arrive on Gan on either 3rd or 4th of October 1960. Thanks to Larry for that suggestion. WRVS were very grateful for a copy of the photograph since they have very little other than written records to do with their operations on Gan."